This is one of the most fiddly things I've done to date out here: A technique I picked up from an organic methods article to help achieve apples that are neither full of bugs (big No Want), or hopelessly scarred (eh, whatever, I ain't selling to no supermarket - long as the flavor is good, they can be as fugly as they like). So, you take Ziplock sandwich bags, zip them around your budding apples, poke a couple small holes for drainage, and there you are. 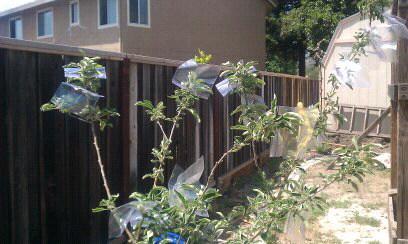 Hopefully, these protected fruits will be worm-free and unblemished. Which is probably why a supermarket organic apple of perfect skin is so danged price. I can't imagine doing a whole tree, let alone a whole ORCHARD! You can try using pantyhose footies instead. The worms inside apples are usually caused by the apple coddling moth, and they don't like the nylon netting of the pantyhose, so they won't lay their eggs on your apples. It's breathable and therefore less likely to cause mildew or mold on your apples if it's rainy. I have seriously considered offering to buy a box of nylon footies from my local shoe store, because they are hard to find! Or just make your own with some cheap pantyhose & sewing machine (what I ended up doing). Happy gardening!